Iliocostalis Lumborum is the most inferior and lateral of the erector spinae muscles. Posterior part of the medial lip of iliac crest, supra-spinous ligament and the lateral crest of sacrum. Dorsal branches of the lumbar arteries from the aorta. Dorsal branches of the lateral sacral artery from the internal iliac artery. Characterised by Type 1 muscle fibre, indicating the tonic holding and stabilisation function. Stabilization of Spine: Iliocostalis lumborum along with multifidus contribute to support and control the orientation of lumbar spine. 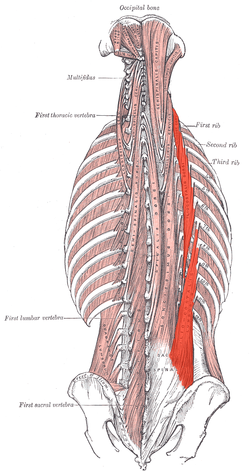 Myofascial pain of Iliocostalis Thoracis- Lumborum muscle causes anterior torso pain. The pain of myofascial origin is a well-recognized pathology characterized by the presence of two components: referred pain; which is often distant from its source and specific to each muscle, and the trigger point, a localized hyperirritable band present in the affected muscle and able to reproduce the referred pain when stimulated. The most common locations of pain were the right-lower quadrant and the left side of the chest. Unsurprisingly, since the referred pain of myofascial pain of the Iliocostalis muscle is located at the frontal aspect of the torso (chest, abdomen, and pelvis), it is a clinical challenge even to seasoned clinicians. The anterior torso pain often results in extensive workups before Iliocostalis Lumborum myofascial pain diagnosis is made. Trigger point injections are diagnostic and therapeutic of Iliocostalis Thoracis-Lumborum myofascial pain. Investigative studies like EMG have shown the involvement of Iliocostalis Lumborum along with external obliques in Pisa Syndrome, which is defined as a reversible lateral bending of the trunk with a tendency to lean to one side. This is a frequent and often disabling complication of Parkinson's disease. As some forms of Pisa syndrome are potentially reversible, there is growing consensus on the importance of its early recognition and the importance of pharmacological adjustment and rehabilitation. Position: Prone with hands clasped behind buttocks or head. Fixation: Examiner must stabilize the legs firmly on the table. Pressure: If performed with hands behind back no pressure is needed. Bilateral weakness of low back muscles results in a lumbar kyphosis and increased thoracic kyphosis. Unilateral weakness results in lateral curvature with convexity towards the weak side. Bilateral contracture of low back muscles results in lordosis. Unilateral contracture results in scoliosis with convexity to the opposite side. a) In prone lying, have the patient tuck in the chin and lift the head, thorax of the plinth. b) To progress further, the patient can vary the arm position. Resistance can be added by using hand-held weights. c) Patient can further progress by lifting one leg off the mat alternately, and progress to both legs simultaneously. d) Further progression can be made - spine extension with both upper limbs and lower limbs lifted off the mat. 2. Prone exercises on a stability ball. 3. Plank and quadruped exercises to develop control and strength in spinal extensors. Trunk lateral bending exercises to the opposite side of tightness and flexion exercises help in stretching the tight muscles. ↑ 1.0 1.1 1.2 Muscle Testing and Function;4th Edition; Kendall, McCreary, Provance; Page No.138. ↑ 3.0 3.1 Therapeutic Exercise for Spine Segmental Stabilization in Low Back Pain; Richardson, Jull, Hodges, Hides; Scientific Basis; Page No.24. ↑ Muscles Testing and Function;4th Edition; Kendall, McCreary, Provance; Accessory Muscles of Respiration, Page No.330.